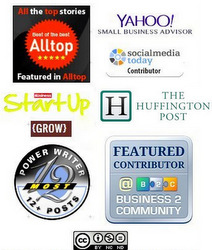 Storify is a tool that many people have probably not given enough consideration to from the business perspective. It allows an opportunity for bringing engagement to a new level by joining community, building loyalty, acknowledging fans in an efficient and fun way. 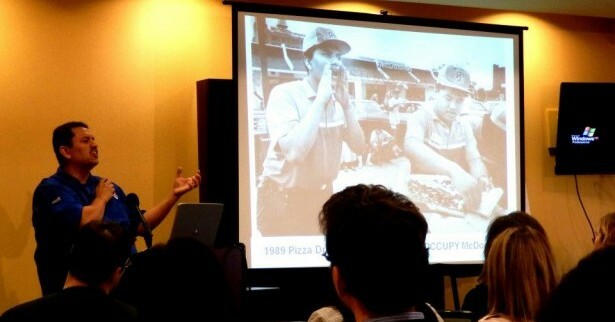 In February I attended #SMBS12 organized by Renee Martinez of Ruby Marcomm. There was an amazing speaker line up and the conference was filled with tweeting participants. Tweeting during a conference is a great way to share experiences with the public. As many of you may know, when an event like this takes place, a hashtag can be used to keep all communications of the event in one place for everyone to follow. For those who aren’t familiar with Twitter or using hashtags, they can participate by following along using a web service like Tweetchat – Here’s an example from the #140confMTl hashtag. This gives you an idea of what happens as participants in any conversation “tag” their tweets with a specified hashtag. On a base level, this is a great way to have engagement. When people are retweeted, they are acknowledged, community can form conversations around it…but this all disappears as the tweets build. In many cases you may have just a few moments to see and acknowledge participants. It can be fleeting. Recognizing your audience, participants, friends. At #SMBS12, Ramon DeLeon. introduced me to a new Social media tool I hadn’t really paid any attention to before. I think I hadn’t really noticed it before because in previous contexts, I had never really seen it for what it could accomplish. 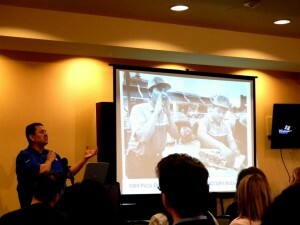 Ramon’s presentation was on “wow”ing the customer, using social media to recognize your clients. Although he didn’t state it this way, his specialty – if I had to sum it up – is making people feel good. Everything he does is pretty amazing, his energy is through the roof! He had a lot of fantastic stories to share on how he used video to give back to his fan base, how he used Social media to “listen” to his audience, and seized opportunities. If you ever have a chance to watch his videos or see him speak, I strongly recommend it. It is amazing how much you can learn from just spending a short time with Ramon. What does Ramon have to do with Storify? The best way to learn is by observation, not by being told or by hearing ideas,seeing and doing things. When Ramon De Leon was finished speaking at #SMBS12, not ten minutes afterwards, I suddenly saw a tweet from him, and it said “You’ve been quoted in my Storify” – I was blown away, what did that mean? How did he have time to blog in two minutes after his presentation? At the same time, I was honored, I thought, how nice of him to take the time to retweet me, or quote me. Acknowledgement & recognition- a powerful customer experience factor. I clicked through the link, and there is was: he has created a Storify and he had managed to include tweets from me, and many others who had been tweeting his words. I was “wow”ed. There was something really nice about the fact that he not only took the time to retweet the participants, but he created a document which acknowledged everyone who had been participating. I don’t know if Ramon even realized what an awesome example of recognizing fans this was at the time, but he did it. I didn’t know Ramon before that day when we met, I was definitely impressed by his talk, but this was something that struck me and was really demonstrative of how you connect people, acknowledge them and at the same time continue to spread your message all in one swoop. He storified. Storify Captures Community That May Otherwise Seem Unconnected. It’s been a few months since #SMBS12, and I have been using Storify ever since. I love it because of the fact that it’s an awesome way to capture the social activity around a shared moment, it allows you to acknowledge everyone – physically present or not, and it allows for a true representation from various social media sources. You can check out my Storify collection. 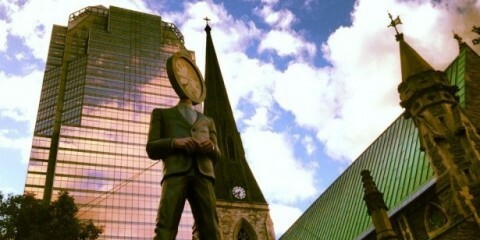 When @Biz Visted Montreal, I used Storify to capture the luncheon and all participants. It was so much more fun than simply blogging about it, and it acknowledged everyone who was tweeting and sharing. Storify is a fantastic way to show this – to collect the messages and images around a shared instance, hashtag or subject and pull it all together to truly show the big picture of what happened. I think my #USGUYS5 Storify is a great example of how using a tool like this captures everyone’s involvement to draw a truly accurate picture. Whether my friends were there physically or not, they were all a part of that evening, Storify allowed everyone to appear in one place together all at once – few other tools allow this multi-layered and unified representation. In Social Media, the real story isn’t like it was in digital print or traditional media. The real story is about everyone out there – your friends, your customers, your fans, and even those who oppose your message/views. Acknowledgement of all these people is so important, whether you are a brand or an individual – it’s the only way to be truly social. Finding ways to do this on a regular basis, to listen, to respond – and interact is the key. If you embrace the tools available to truly share and be involved and present in your communities, that’s what makes for a beautiful story. *Note: I have absolutely no affiliation with Storify, I wrote this because I can see true value in what this tool allows and I just wanted to share my “Story” with you. Want a way to start recognizing all the people who make things great? I think this is a good place to start. Add it to your tool box. In my opinion, it’s a keeper. 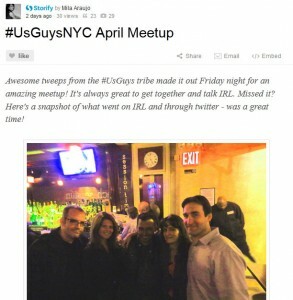 So check out my #UsGuysNYC5 Storify, let me know what you think! Would you use this as a way to acknowledge more people? Show them how important they were to an event or moment? Awesome tweeps from the #UsGuys tribe made it out Friday night for an amazing meetup! It’s always great to get together and talk IRL. Missed it? Here’s a snapshot of what went on IRL and through twitter – was a great time! Every time I meet Susan, who we have dubbed as the “Christie Brinkley” of #UsGuys – we have great talks! It was so nice to hear about her new position at the IAB, shes rocking it! They are lucky to have her! Karlton and I were finally able to catch up on some great plans for the #140confMTL Real Estate Panel, which will also feature @LewisPoretz ~we missed you Lewis! But we’ll see you in Montreal May 15th for the conference! Was amazing to meet Stan IRL for the first time, and he taught us all something about the Statue of Liberty we hadn’t seen before! Stay tuned for a video, until then…here are some pics. We’ll see you at #140ConfMTL Art 🙂 Looking forward to your talk! Even though not everyone could make it, Everyone was there in spirit! Plenty of glasses raised to toast all of you! Have you heard of RawPorter yet? 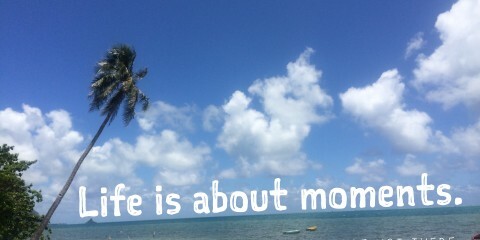 Had a great conversation with Rob and Noni on this awesome new app. 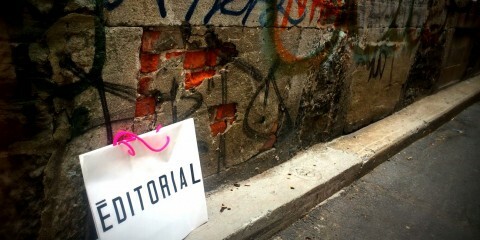 Look out Instagram and Pinterest, this one brings a new twist, and its photographer centric! Isn’t that what everyone’s been waiting for? Loved hearing about what they’ve been developing! Noni and I also skipped across the street to visit The Cigar Inn, where she showed me a little about Cigars and took me into what seems to be North America’s Largest Humidor before we headed back to the meetup. Thanks to everyone for a killer great night!! Great conversation, Smiles, hugs, sparkles, fire and all! #UsguysNYC5 Rocked!